Onboarding is one of the most important parts of creating a product people use for a long time. But without a retention plan, all that time spent acquiring customers is for nothing. To keep users engaged, you need to spend time getting to know how they use your product and how they respond to the way you want them to use it. This needs to be done at each stage of the customer lifecycle so that users are retained for longer. We're going to look at how to use your user data to figure out how to retain users once they convert. Let's get started. First, a user discovers your product through an online ad, organically through a web search, or through a recommendation from another user. Then, after browsing through your site, they sign up from a free trial. During the trial, they check out product features and read a few blog posts. When they find out that your product's a good fit for the problem they have, they sign up for a paid account. Over time, as they continue to see value in your product, they keep using it and refer other people. Their advocacy generates more revenue for you and creates and strengthens the relationship. Some keen users even become power users and use all of the enhanced features your product offers. The customer journey is a great way to understand the relationship between your product and users. For example, you can see where along the path users drop off and make improvements to keep them engaged. Your ability to attract users and move them through each step will determine how successful your product is. Turning users into advocates is more than improving your onboarding. Onboarding is an important part of the journey because this is where most users decide whether to stay or go. But as long as you show value along the customer journey, users are more likely to keep moving along the path. There are three things you need to focus on to make this happen: onboarding, retention and continued value. Analytics helps with this. First, use a tool like Amplitude to figure out what you need to convert users and move them from consideration to purchase. This is where users experience your product's value for the first time. Next, improve retention by making it clear to users what they have to do to get the most out of your product. This can be as simple as a guided tour after onboarding. Track these steps in Amplitude so that you can test their impact on user follow-through and retention. Finally, find opportunities to add more value to keep users engaged. Analytics will tell you if you've chosen the best call-to-action to get users to come back often. Let's take a closer look at how to use analytics to move users through the customer journey and how to use the data to improve your product. The first thing to do to create a well-rounded customer journey is to figure out your activation event and rate. The activation event is the point where new users experience your product's value for the first time. At this point, users decide to buy something because your solution addresses their pain point. The activation rate is the number of people who followed through after visiting your site. If you attract one hundred people to your site and twenty buy something or start a free trial, your activation rate is 20%. It's natural for users to drop off after this initial point and then taper off until churn reaches a plateau. You can't change this outcome, but what you can do is make changes that reduce the number of users that drop off during the first month after signing up. This retention curve shows us that of all the people who initially downloaded an app, only 28% came back the next day. Even though churn slows down heading into day two onward, it continues for several days before leveling off. What you're left with are the core users you want to retain long term. Understanding your retention curve is where Amplitude comes in. Once you know what your activation event is — for example, users buy something — figure out what the ideal path there looks like. Let's say your activation event is a cart checkout. Your conversion funnel should include the ideal steps needed for users to get from initial sign-up to checkout. Use Amplitude to define these steps and track how many users go through the funnel. Here we see that once users sign up, they're expected to browse products, choose something and then check out. You've chosen the right events and order. Your events and/or order aren't moving users towards activation. If you find yourself in the second scenario, create a new sequence of events or specify if events can be performed in any order. Tracking events that can happen in any order works best for products that have more than one way to reach the activation event. For example, if you have a fitness app, the activation event might be when users sign up to start a weight loss plan. They might browse meal plans or workout plans before converting, so it makes sense to track events in any order. What you want to see at the end of your analysis is a higher retention curve that has a smaller dip after day one and plateaus sooner. So instead of 28% of users left at day one, you might have 40%. Want to dig deeper? Check out our in-depth post about building a user onboarding funnel with Amplitude. Once you've figured out the best sequence of events to convert users, the next step is to find a way to help users see value often. The better you understand your users and their needs, the more likely you are to retain them after onboarding. To make this work, find ideal customers in your niche — people in your target audience who've shown interest — and help them to experience the activation event as early as possible. These are users who've submitted a lead form or signed up for a free trial. 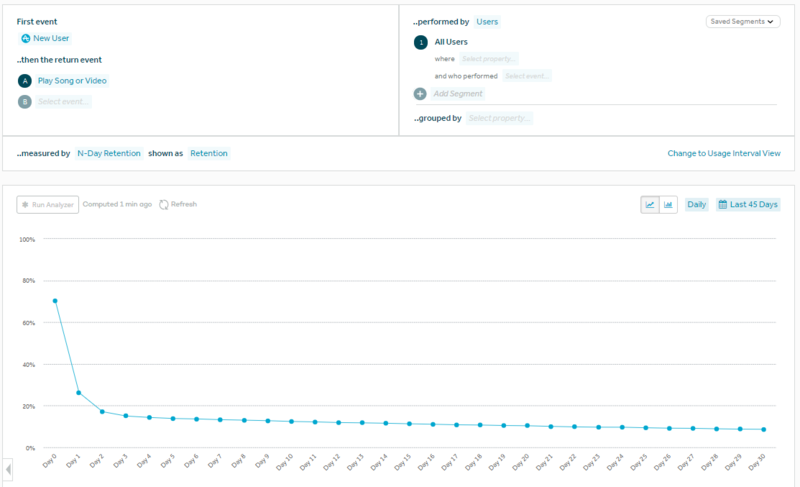 Using the retention analysis feature in Amplitude, define your app's return event. 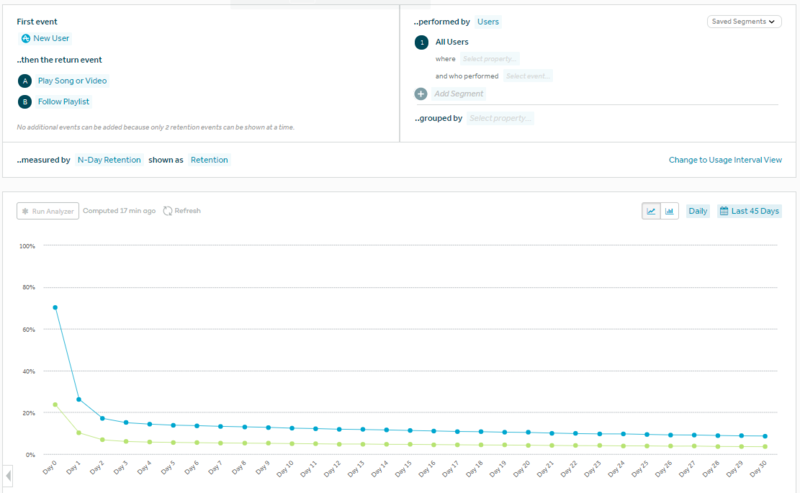 This shows you how many users return to your app to complete a specific task. If you have a music streaming app, the return event might be users coming back to play a song or video.Here you can see that 70% of users returned to the app and completed this return event. On day one, 26% of this group came back to play a song or video. Here you can see that 70% of users returned to the app and completed this return event. On day one, 26% of this group came back to play a song or video. To test whether this return event is the best option to drive retention, compare it against another event. For example, instead of playing a song or video, test if driving users to follow playlists instead results in higher retention. What you see here is that this new return event — in green — only applies to 23% of all users. This is compared to 70% who play a song or video. On day one, only 10% of these users return to follow a playlist. This quick test verifies that you're driving users to the best action to boost retention. You can take this analysis one step further by incorporating your buyer personas to create behavioral cohorts. This way, you can see which specific groups of users return to your app to complete defined actions. On the right side of this chart we compare users in the power user cohort against each other. Keep in mind that return events can be different for each buyer persona. Use the resulting data to improve how your product flows — emphasize the return event as part of onboarding — and improve retention. A common misconception is that products have only one aha moment. But the truth is, your product has the opportunity to have more than one. As people use your product, their experiences determine whether they'll stay or leave. One example is customer service. How many times can you say that you've been turned off of a product because of poor service? Customer support is your golden opportunity to follow through on your promised value and remind users why you're the best choice. Mess this up and all that hard work acquiring users was for nothing. 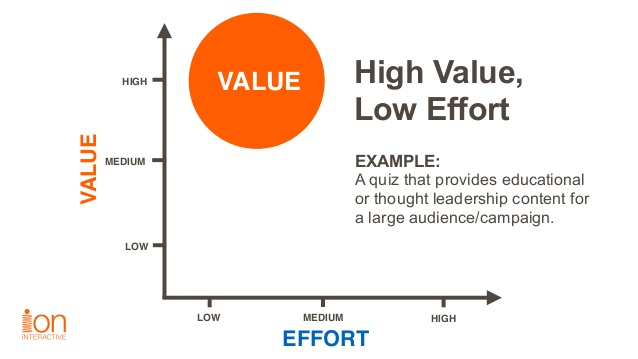 Emphasize additional aha moments by creating experiences that are Low Effort, High Value (LEHV). This can be as simple as sending regular emails to explain new product features or invite users to an industry event. How do people use your product? What event flows do they follow? At what point do users drop off? Are there bottlenecks or is the added value not clear? Which usage paths lead to the highest conversion and retention rates? To figure out why some users churned and others stay, use the resulting data to run tests. Do popular paths work with more than one segment? Do more users experience additional aha moments and stay? Use the results to set up a process that gets users to experience value as soon as possible — in different parts of your product. Onboarding is the key to successfully retaining customers. As more people use your product, use the data you collect to offer them an experience that constantly shows them the value you offer. Remember, satisfied users are more likely to refer their friends, which is a low-cost growth strategy for you. Use what you've learned along the path from onboarding to retention to make sure that new users experience your aha moment early on. This way, you're indirectly attracting more users and catering to their needs to keep them around longer. When you follow through on what you've learned, you'll experience exponential growth.